All dogs need some training now and then, if you have a need for some behavior modification for your dog, to learn some new tricks, and for a path to well behaved pet, see the list below of trainers that are available to help. The Trainers are separated into Type. It's important that you are comfortable with your trainers methods. We recommend you go watch a class before deciding which trainer to work with. Are you a trainer in the Southern California area and would like to be added to our list? Click here to Contact Us! Owner, Laurie Zurborg, has 11 years experience and is recommended by several local veterinarians. Serves So. Orange County with daycare, obedience (group/private), beginning agility, Free doggie social club, boarding (short/long term), & in-home pet sitting. Training methods include positive reinforcement, clickers, gentle leaders. No choke collars or force. Very experienced with shelter/adopted dogs, problem behavior & undersocialization. CPDT certified. Specializes in behavioral modification. We offer private and group training, rescue adoptions and grooming. Our goal is to bring harmony back into your household. We are not a ”one size fits all” training program. We customize programs to meet the needs of each individual pet and person. We are able to work with many breeds and behaviors due to our Behavior Specialist Farren Mahone, B.A. Glenn is a Certified Professional Dog Trainer (CPDT-KA) who has worked with all types of behavioral issues, and specializes in working with challenging dogs. Glenn's method of training is based on the positive foundation of building trust, respect, and desire. Training should be a positive experience, not punishing. Glenn trains dogs using a martingale collar, or a standard buckle collar. No type of electronic collar "training aid" (e-collar), or any type of choke chain, prong or pinch collar of any type are ever used. These "tools" are not necessary to train a dog. Offering group classes and private lessons in the San Fernando Valley and surrounding areas. Motivational training methods for humans and canines.... "Learn while you play"
Conducts group classes and puppy classes, as well as privates. Methods are all positive and reward based. Has worked with Aussies, shelter dogs and rescues in problem solving, behavior issues, aggression, and basic obedience. We use gentle, reward based methods and have over twenty years of experience in the dog training field. We offer private in home instruction as well as board training. We are also starting a free group class for animals adopted from animal shelters or rescue groups, Tuesday evenings starting at 6pm or 7pm, depending on clients' schedules, contact us for more information. Both you and your pet will love! A 'Nationally Certified' and 'Nationally Accredited' Dog Training Instructor, providing modern humane and practical pet training techniques using "Operant Conditioning" and "Leadership", to dog teams throughout Orange and parts of Los Angeles Counties. Teach your dog at home “Basic” and “Advanced Obedience”, as well as and Behavior Modification, Problem-Solving for Aggression towards Dogs, People, excessive barking, boundary control, destructive chewing, separation-anxiety, digging, door dashing, fearfulness, fence jumping, potty training, jumping on people, play biting or mouthing, getting into trash or counter surfing. Prepare dog to pass Therapy Dog Certification (TDI), AKC Canine Good Citizen Certification (CGC), Conformation, and Assistance Dog Training/Certification (FSDS). Do you want your Dog to be Good? An in-home training program for dogs or puppies of any breed. Invest in an education that will last a lifetime. Learn more about this successful training program by visiting the Good Dog K9 Training website. The Tellington TTOUCH Method is a gentle approach to working with animals without fear or force! TTouch is used to support training and behavior modification as well as veterinary care. An additional benefit is a deeper rapport between humans and animals through increased understanding and more effective communication. TTouch creates an awareness and positive changes in behavior. It offers solutions to common behavioral and health-related problems, such as aggression, separation anxiety, excessive barking, chewing, jumping up and leash-pulling in dogs, resistance to grooming, nervousness, shyness, thunder or loud noise phobia, and so on. It can help to promote good health and ease problems associated with aging, illness, hip dysplasia, arthritis, and surgery. Soothing touches, balance techniques and "a playground of higher learning" all combine to help improve your animal's health and behavior. This is training for the body, mind and spirit of your companion animal. A well-behaved dog is a joy to be around - one who will be treated as a beloved member of the family, and is welcome everywhere. Using praise and reward-based techniques, your dog will quickly come to view training sessions as fun, and learn that responding to your commands yields positive results. Make the investment in your future together by setting-up a positive relationship now - one that is based on love and mutual respect! Devil Dog Ranch offers group classes, private in-home sessions, private sessions at Devil Dog Ranch, pre-adoption counseling & dog selection - check out the website for more information. Handle With Care offers in-home private instruction as well as all levels of obedience seminars, dog adoption assistance, and so much more. Handle With Care uses fun, reward-based training. Instant Karma Dog Training believes that successful training cannot be achieved without mutual trust, respect and love between handler and dog....that the Emotional Energy brought to training by the human is a vital component for behavioral transformation in the dog....that there are many different paths to achieving a goal or result. Our task, as enlightened human beings is to seek out those paths that will best achieve the desired result for each unique canine and human client. Offers mostly private training in Los Angeles, the San Fernando Valley, Santa Clarita and the east San Gabriel Valley. Kim has worked with professionally with dogs for 30 years and owns 3 Australian Shepherds of her own and has also fostered a dog for Aussie Rescue. She uses a variety of positive reinforcement techniques. There's really only one absolutely unbreakable rule at Ain't Misbehavin' K9, which is that every dog be treated with fairness and dignity. It's the least we can offer them in exchange for what they offer us every day...Uncompromising and unconditional love! Providing a variety of puppy training, dog training, and behavior modification programs in Northern Orange County and portions of Long Beach, CA. All of our training programs are expressly designed and customized for your dog, your needs, and your lifestyle. Possessing a combination of formal education in Learning Theory, Etiology, Animal Husbandry, and Nutrition with years of experience, and use of cutting edge, science based techniques we will help you and your dog achieve successful, lasting results for a bonded relationship and lifetime of enjoyment. My name is Kelly Caldwell, and ever since I had my first dog, I've always dreamt of being able to work with dogs everyday. A few years ago that finally became a reality!! I've been training and exercising dogs for over a decade, but I was finally in the position to make it my only job!!! Bark At The Park, LLC is comprised of myself and two independent contractors who have great knowledge and care for animals like I would. You can ask any client that I have, and they will tell you, I will love and care for your dog(s) as though they were my own! Here are some of the services I currently offer. Dog Training: In home private training that is customized to your dogs needs. Which may include: obedience training, puppy training, aggression problems, separation anxiety and more. Overnights: Includes feeding, refilling water bowl, bringing in the mail and newspaper, taking out the trash on trash day, and watering small house plants. Dogs will get a morning and early evening walk around the neighborhood. All pets will get interactive time which may include petting, snuggling, brushing and/or play time. Boarding: Your pet will be in a cage free environment, and treated like one of my own, a few repeats have even been known to sleep with us. Socialization and Group hikes: Great for dogs to release the energy as well as getting to play with their new friends. This will include pick up and drop off as well as guaranteeing out of the house for 2 1/2 hours. This typically is a trip to an off leash Dog Park. Usually once a week I take the group on an off leash hike. Recommended for dogs that are already social and have lots of energy! Private Walks: Walk around your neighborhood so your dog gets some needed exercise and some fresh air time. Private, in-home training for everything from basic obedience to serious behavior issues. Group classes also available. Irith Bloom of The Sophisticated Dog offers modern, science-based training that is effective and enjoyable for both the handler and the dog. She is certified by multiple organizations and is regularly recommended by local veterinarians. She is also a frequent speaker at conferences and seminars throughout the U.S. and internationally. Whatever your needs, The Sophisticated Dog can help. Behavioral consultants, boarding, pet training while boarding, group & private, basic & advanced obedience; non-correctional motivational methods, positive reinforcement; Gentle Leader Head Halters, clickers and food lures for beginning obedience classes. Group and in home, trains dogs through reward and praise methods, basic obedience and occasional handling classes. Private and group lessons, problem solving, beginning and advanced obedience training. Discount given off obedience class with adoption contract from a rescue or shelter. In-home, private training for behavior modification and obedience using gentle, positive methods including clicker training. Nicole Wilde is a professional member of the APDT (Association of Pet Dog Trainers) and has worked with both domestic and exotic canines (specializing in wolves and wolfdogs) for many years in training and rescue. Her motto is "Train with Affection, not Corrections!" Is your dog behaviorally challenged? Then teach him DOGGIE MANNERS. Doggie Manners is a reward-based training course that integrates basic obedience into your everyday life. Your dog will learn to come when called, walk quietly by your side, wait at doorways and curbs, greet guests politely - and much more! We offer private lessons throughout Greater Los Angeles and currently teach classes in West Los Angeles and Long Beach. We work with puppies and dogs and specialize in rescue dogs. Please remember, habits don't change overnight. Give yourself and your dog a chance. We look forward to working with you. Serving Southern California Canines and Their Humans Since 1969! We offer Puppy Kindergarten, Dog Obedience Training, Agility, and Canine Good Citizen Certification. Convenient group classes in over 40 communities throughout Orange County and adjacent areas of Los Angeles, Riverside and San Bernardino Counties. Private lessons also available. We look forward to helping you to make your dog a more enjoyable family member! We offer quality Dog Obedience and Puppy Training classes at very reasonable fees. My name is Barbara Johnson and I am a CPDT-KSA and a Certified Fear Free Trainer. I am also a Family Paws and Parent Educator which allows me to work with expectant families, families with toddlers and young children. I am a long-time Aussie owner, currently loving and adoring our Aussie #5!! I enjoy working with Aussie families because it takes a special person/family to bring an Aussie into their home. I especially enjoy working with children, so that no child grows up being afraid of dogs. I offer in-home private training and that includes your home, your office or any public places that dogs are allowed. My training motto is Catch Your Dog Doing Something Good! Excellent website of Clicker Training Lessons, offering step-by-step obedience lessons, regular as well as problem behaviors, for free, from the training school Greenwood Dog Training School in Delaware. Great website outlining the "Nothing In Life Is Free" behavior modification training program, by Deb McKean....check it out! Excellent facility/services. All levels of classes, from puppy through utility, are taught by the Club's members on a volunteer basis. Rancho Park/Cheviot Hills Recreation Center. Agility and obedience classes for puppies and dogs; positive reinforcement training, companion and competition training, all dogs welcome. 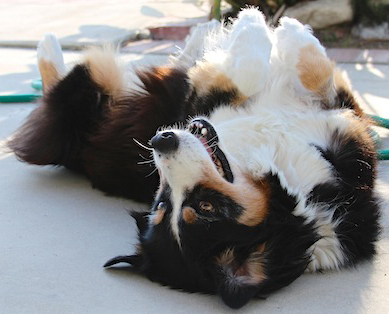 Contact Point Agility offers dog agility classes in the Los Angeles area (Northridge). They have beginning through advanced classes 6 days a week. Contact Point Agility is proud to offer our students instruction by experienced agility competitors and trainers. Breed handling, junior showmanship; all level obedience, competitive and fun; puppy through master level agility, show and fun; puppy kindergarten; all levels of clicker training; home manners and tricks; quarterly Canine Good Citizen testing. Private lessons for obedience and behavior problems, classes coming soon to Palmdale and Santa Clarita area. HERDING at the Drummond Ranch. Specializes in K9 Nose Work. Clicker trainer, positive methods used. Can’t find a trainer in your area? Check out Association of Professional Dog Trainers - They have a worldwide directory on their website.